With an ambitious new residential development, Orlando, Fla., offers a vision of the city of the future. In between the roller coasters of the Magic Kingdom and the rocket launchers of Kennedy Space Center, the gabled roofs of Orlando’s Lake Nona community peek above a distant tree line. At first glance, as you drive past its neighborhoods and schools, its restaurants and grocery stores, you might think you’ve stumbled upon a bedroom community for white-collar professionals employed at nearby Orlando International Airport or the city’s theme parks and business districts. It looks pleasant, prosperous and brand spanking new. But keep driving and you’ll see this is not your typical subdivision. Just beyond Lake Nona’s elementary school and its nearly completed 55-plus active adult community is the new Orlando Veterans Affairs Medical Center, the first VA hospital built in the United States in more than 20 years. It’s just one of several facilities that make up Lake Nona Medical City, which is contained within Lake Nona’s astonishing 10,800 acres. While other communities might offer a doctor’s office and pharmacy, Lake Nona is home to a world-class cluster of hospitals, research institutes and universities, including the University of Central Florida Health Sciences Campus, Nemours Children’s Hospital and the University of Florida Research and Academic Center. Lake Nona Medical City’s innovations aren’t just for patients. After a recent talk at the invitation-only Lake Nona Impact Forum, a gathering of healthcare thought leaders and innovators, Deepak Chopra led a meditation on the lawn of the community’s Crescent Park. The same night he announced he was rolling out a special Lake Nona edition of his well-being application, Jiyo. Further north, a few minutes from Lake Nona’s tapas bar, is the United States Tennis Association’s National Campus, as of its opening in 2017 the largest tennis campus in the country. More than 450 tons of red clay were imported from Italy to create its six Terre Davis courts, most outfitted with technology that allows players to livestream their matches or analyze their games. 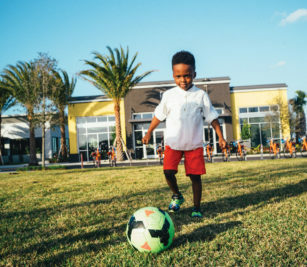 Soon, the new training facility for the Major League Soccer team Orlando City will also open in the Lake Nona Sports & Performance District. Lake Nona’s fiber-optic network is capable of download speeds 10 times the national average. Running beneath all the sports and medical facilities, the townhomes and apartments, and the parks where neighbors gather for community concerts and food truck rallies, is Lake Nona’s fiber-optic network, capable of download speeds of up to 1 gigabit per second—about 10 times the national average—and a huge boon for the data-hungry medical facilities on hand. The advanced technological infrastructure caught the eye of Cisco, which awarded Lake Nona one of its influential Smart+Connected Community designations. Joining the ranks of cities like London, Barcelona and Moscow, Lake Nona was the first community in the United States to earn the title. In the coming months and years, the community plans to roll out more digital advancements, including intelligent buildings, smart work centers complete with the most advanced Cisco TelePresence videoconferencing technology and a car share program featuring Tesla Model 3s. “I can’t imagine why you wouldn’t want to live in a community like this,” says Lindsay Thorn, a physician assistant currently staying at home with her two young sons. She and her husband, David Thorn, a development director at EA Sports, live in Laureate Park, one of Lake Nona’s flagship neighborhoods. 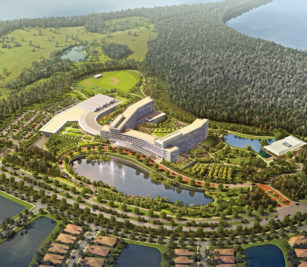 Indeed, Lake Nona is one of the fastest-growing master-planned developments in the country. The 17-square-mile community makes up around 10 percent of Orlando’s land area, but between 2014 and 2016, accounted for 18 percent of its residential growth. With its innovative take on combining top level healthcare, sports, technology and other amenities with residential planning, Lake Nona is offering a futuristic vision of how people should live—in a city better known for its tourists than its residents. It is also a vision for the future of Orlando. To help the community attract more residents and businesses, the city has spent more than $80 million on infrastructure improvements in and around Lake Nona. The region has launched a marketing campaign—its theme? “Orlando: You Don’t Know the Half of It”—that highlights Lake Nona and other ambitious ventures in an effort to bring more companies and entrepreneurs to the city. “Orlando is already known worldwide as an epicenter for tourism,” says mayor Buddy Dyer. In fact, it’s the most visited destination in the country. But many businesses and corporations don’t realize the city is also home to high-tech industries including modeling, simulation and training; life sciences; and aviation and aerospace, he notes, as well as a strong entrepreneurial ecosystem. And then there’s Lake Nona, combining technology and an innovative mind-set to create, refine and execute a vision for how people want to live—connected not just with walking paths (the community has 44 miles of paved and unpaved trails) but with the most advanced infrastructure and high-tech amenities. Lake Nona is a creation of Tavistock Development, a real estate firm owned by Bahamas-based Tavistock Group. The privately held investment organization was founded more than 40 years ago by Joe Lewis, an 81-year-old self-made billionaire who got his start at his family’s catering company. After growing and selling the family business, Lewis made his fortune as a currency trader—his bets against the British pound and the Mexican peso in the 1990s were among his biggest windfalls—and now has an estimated net worth of a little more than $5 billion. He is an avid art collector, and the Lewis Collection is one of the largest private art collections in the world, featuring major works by Degas, Matisse and Picasso, just to name a few. Lewis is a private man who almost never gives interviews, but he has made Tavistock an immensely influential development company. The development’s vision is also a vision for the future of Orlando. The vision is still evolving. New projects on the Lake Nona horizon include the Pixon community, which will feature Orlando’s first micro-apartment units, as well as amenities such as Bluetooth door entry, a pet spa and a community 3D printer. Last year Tavistock Development also announced a partnership with Intersection, a sister company of Google that provides smart-city technologies, to expand the Lake Nona Town Center, the retail and entertainment heart of the community. At full build-out, the Town Center will feature more than 80 specialty retailers, restaurants and entertainment facilities. With several award-winning digital projects under its belt, including Link, which it calls “the largest and fastest free public WiFi network in the world,” Intersection is sure to bring plenty of advanced technology to the Town Center table. But in addition to buzzworthy projects like the “first-ever connected, responsive retail experience that will respond to consumer preferences,” the project also includes more everyday, fundamental changes, like improvements in parking, traffic flow and wayfinding.